A good-quality book light can be an excellent gift for a bookworm, and if you love reading, they can be a great item to buy for yourself. Booklights can really help enhance your enjoyment of a book, as they provide high-quality light that lets you forget about the physical act of reading and simply immerse yourself in the story. Today, we are going to take a look at one of the most popular book lights on the market. We’ll assess its pros and cons and see if it could be the best product for you. So, first off, just what are we looking at here? This is a book lamp that measures around 6.6 inches in length, while the base unit is about 2.5 by 1.5 inches in length and width, respectively. It is a cordless lamp, but unlike many others on the market, it does not use batteries. Instead, it contains a built-in, rechargeable 1000mAh battery unit. The unit contains six LED lights, which combine to produce a color temperature of up to 3000 Kelvins, and the light output level can be easily adjusted. Definitely, this product is for readers. Specifically, if you are a reader who likes to read at dusk or at night, then this is designed for you. Also, if you are a reader who shares a reading space, for example, if you like to read in bed while your partner is asleep or watches TV, then this product is also perfect for you. Inside the box, you will find one LED book light with the dimensions we mentioned above and a weight of around 2.15 ounces. The product also includes a USB adapter cable for charging. It should be noted that this unit can also be charged via an adapter that plugs directly into a wall power outlet, but this item is sold separately. There are a number of features that really makes this product interesting. The first thing to note is that it packs in a very useful 1000mAh rechargeable battery. It’s great to see a rechargeable battery mounted as this is a going to add a high degree of both mobility and convenience. Mobility because there are no wires or power cables connected, and convenience in the fact that it is always ready to go, provided you keep it charged up, of course. The six built-in LED bulbs produce the light manifested by this lamp. This is an excellent figure to see as they are going to provide excellent light levels without placing too much of a strain on the battery. That is why this model can produce up to 60 hours of reading time, which is a very useful amount and higher than many other models on the market. It’s also good to see that the light level has three different settings, allowing you to customize the level of light to suit your conditions during reading time. Finally, it needs to be noted that this model has a lovely, small, and lightweight design. With these types of reading lights, you really want them as light as possible, and at just a tad over two ounces, you will be able to attach it to your book for prolonged periods without noticing the extra weight. One thing that should be noted with this product is that it is designed to be mounted to the book you are reading, via the clip built into the base of the unit. It’s worth pointing out because there are some models of the book light, which look very much like this model but are designed to be clipped to the bedstead. Aside from that, the operation is all in all pretty simple. You just clip the lamp to your book and turn it on. Then, check that the light level is correct and adjust it up and down depending on what feels comfortable for you. Then, crack open that book and get lost in a world of fiction. As we mentioned above, this is a product designed to clip directly to a book. Most people find this design of book light to be extremely comfortable, but it is by no means a design that appeals to everyone. 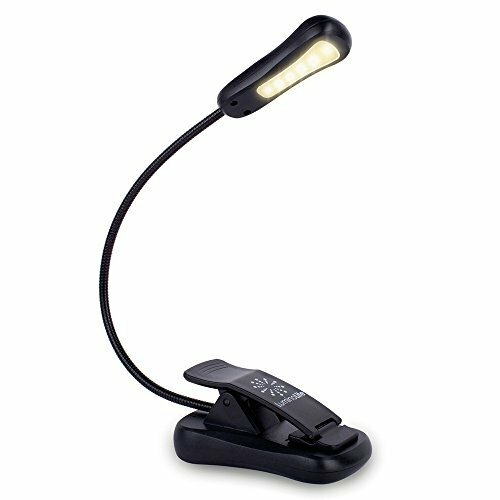 If you prefer a booklight that is not be attached directly to the book, perhaps consider the W-Lite LED Reading Light. It is a bit bigger than the model we have looked at today, but it is built to be attached, via a simple-to-use clip, to the bed frame instead of the book. It also provides a high quality of light that can be adjusted to meet your needs. The LuminoLite Rechargeable LED Book Light is a very well designed and useful device. The fact that it is so small and attaches directly to the book, as well as it has no wires, make it both a functional and practical reading light. Add in the fact that the light levels can be easily adjusted, and you get a reading lamp with a very reasonable price that will go a long way to enhancing your reading experience, then you have a product that gives great value for your money.